Rocket Mail took place in 1959. 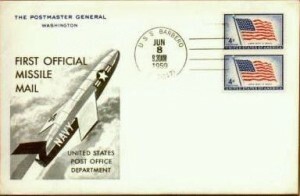 The United States Postal Service launched a missile, loaded with commemorative letters, from the USS Barbero, located off the northern coast of Florida. The missile safely parachuted down with its contents in Florida. There was thought that rockets could quickly deliver mail from continent to continent, but rocket costs and numerous setbacks halted the plans.